Project purpose: To provide a way for marketers to monitor and plan for any type of marketing activity in an interactive and collaborative way that integrates with Adobe’s content management product. Target users: Mid-high level marketing managers that plan initiatives and manage campaigns across multiple touch-points. Duration: 8 months with 40% of my time. Team Members: Matthew Deutsch: project manager. Andreas Kuefer, Matt Aune: design management. Ross Phaler, Danielle Robinson, Devon Govett: Engineering. Project Advisors: Jordan Kretchmer: executive sponsor. Lindsay Browne: design systems. Andy Welfle: content strategy. This project began by talking to marketing professionals who plan and coordinate campaigns. After understanding what they want to see and why, I then began exploring how marketing initiatives could be visualized. These early wireframes are attempts at exploring a multi day view in two different representations gantt view (on the left and middle) are best suited to long running events such as campaigns, that span multiple days, weeks or months where the user wants to see the start and end time. While the standard month or grid view (on the right) is best suited for a dense view of events where the start time of an activity is the priority. Some mobile wireframe explorations of how campaigns and events could be viewed, edited and filtered on a mobile device. After the feature set was partly defined I began exploring visual styles for the solution. The following examples are in a dark UI that worked well for Adobe’s Creative Suite but ultimately I felt were too heavy for this product so I changed direction and went with a lighter treatment. As social marketers were a priority a day view where single point in time events such as a social post was a priority. This screen shows a multi day view with events listed in chronological order, and with an asset preview if they existed, blue indicated it was live and a checkmark for it had completed. Here I am exploring some different expressions for the UI both in terms of features and aesthetic. This was done during a time where our department style guide needed updating and some of the directions and elements I explored during this project were incorporated into the first Adobe wide design language code named spectrum. 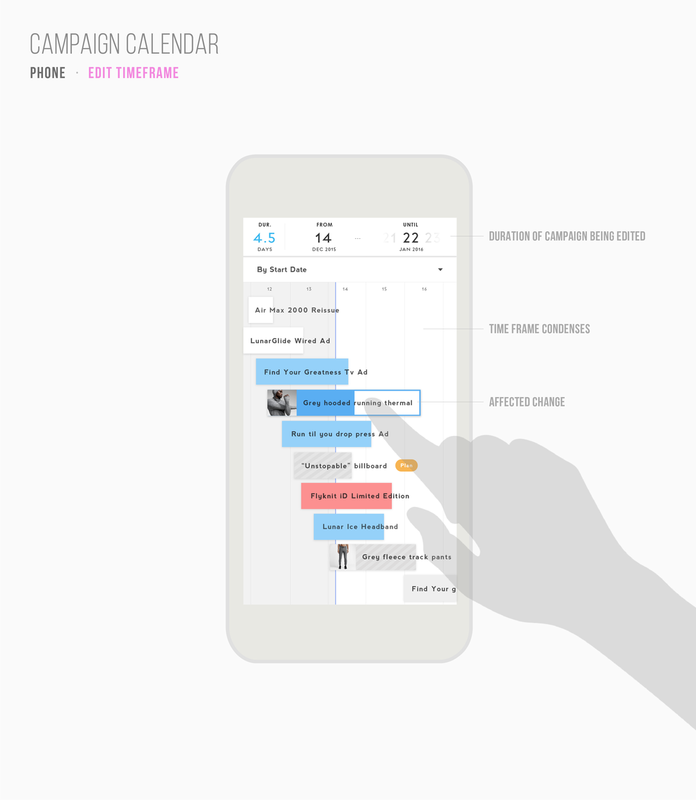 This is another exploration of a timeline view best suited for visualizing campaigns or multi day events. I am exploring style and information density and navigation, playing with color to communicate event status to lighten up the UI. The grey background was supposed to be the past, with blue timeline items for active events and a visual indicator for budget. As the product was intended for monitoring, I proposed a TV mode where a companies campaigns and events could be represented. Users can interact with the product in TV mode to scroll through time or select an event to see details. 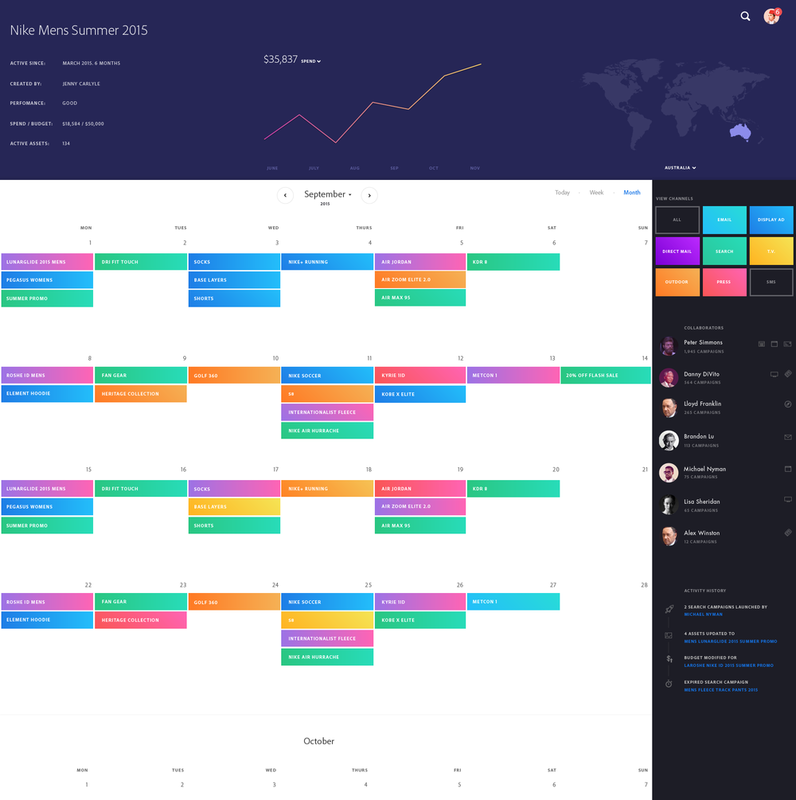 This was a proposal for a timeline view of multiple campaigns and the activities inside them. It was problematic due to the engineering required to be able to show pull in real time so many activities inside a single page. This was another treatment with the same idea, where there is more real estate for each activity and color coded based on its status. 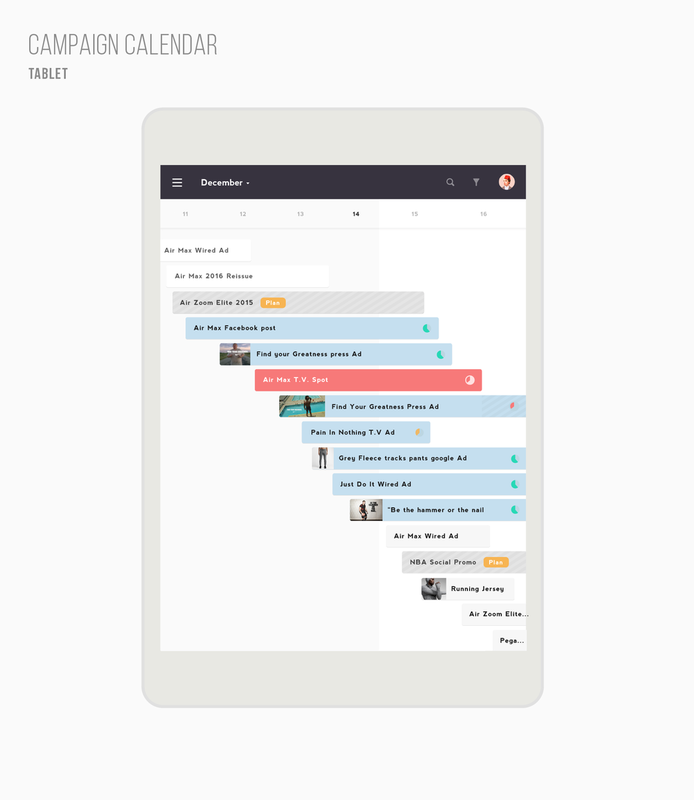 The final design has three views, timeline, column and list. Timeline is best suited for viewing campaigns and column view is best suited for viewing point in time events and list view minimizes dead space, showing more event details and allowing for scrolling through all events in chronological order. As companies can have tens of thousands of marketing activities, they needed to be able to be organized into campaigns and inside a single campaign users wanted the ability for multiple dedicated calendar views, e.g. summer 2019 campaign with a calendar dedicated to each region. This shows a timeline of all activities for a company. This view is showing only social activities which do not have a duration and instead go live at a point in time. This type of view is best suited for viewing multiple campaigns. 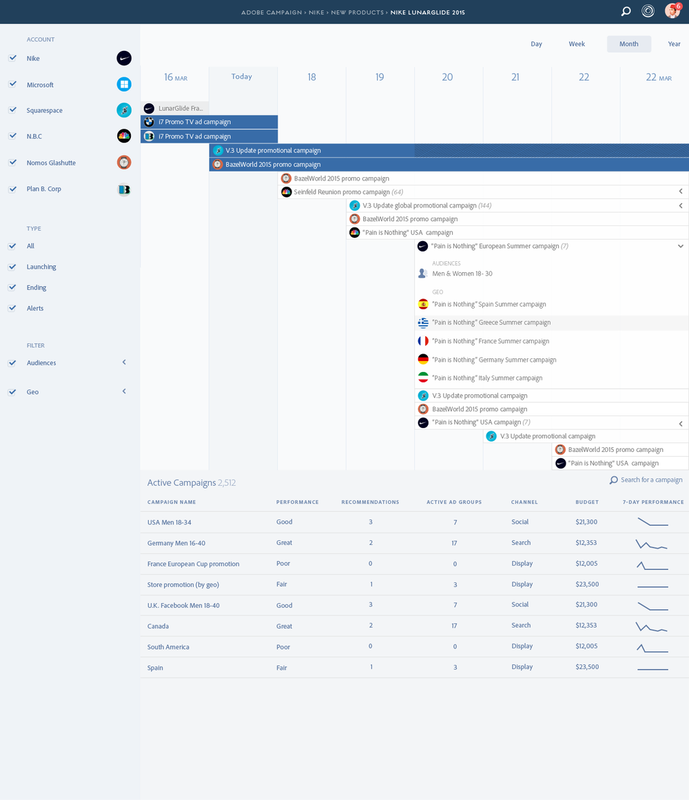 This view shows the list view of marketing activities where users can scroll through everything scheduled or planned to go live. 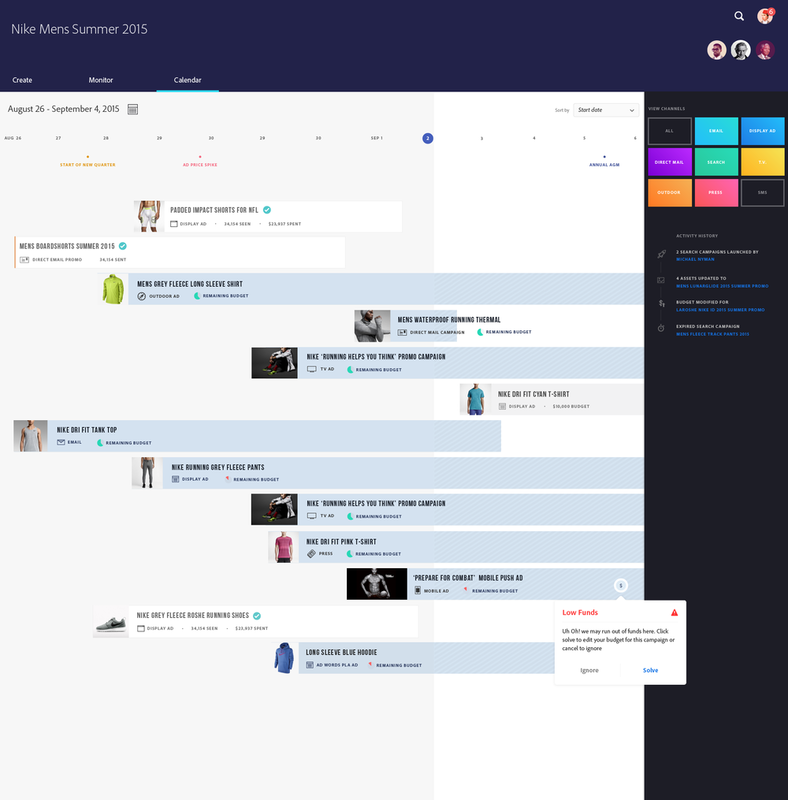 This column view - shown here in a widescreen format is well suited for social activities such as email and facebook post, this view helps marketers at a glance see conflicts, monitor whats live and scheduled as well as plan for future activities. The timeline scrubber on top was a detail that took lots of finesse to get right but allows users to visualize the amount of events in view and surrounding it and provides a fun and fast way to scrub through time.